O&K Furniture Wall Mounted Pipe Shelves A sleek set of wall shelves which create additional shelving space at home or office for displaying and organizing books,keepsakes, towel, keepsakes, decorations or storing items in entryway, home office, bedroom, bar, caf, diner and more.This pipe wall shelf constructed from vintage green finished MDF board and bronze metal frame, perfect blend of rustic meets industrial, adds vogue and beautiful touch on any wall!Efficient Space UtilizationReduce clutter and highlight decor in a small or large area, give the illusion of a larger space in your studio apartment, dorm, or small living quarter.Highlight Your SpaceWater pipe style frame differ from ordinary straight edge shelves/wood ledge, add a industrial and rustic touch to your decor, which highlight your home when compared with those shelves of straight edges.FeaturesVarious colors of pipe and shelf heights can be chosen Made with good craftsmanship, the MDF board and sturdy metal frame design offers a superb durability, improve the weight capacity and enhance the stabilityNo more sweating and back pain from carrying heavy furniture. Buy it as a gift to make a friend or family member happySpecificationsWeight Capacity: 80-lbsMaterial: Metal pipe and MDF boardDimension: 31″W12″D23″HHeight between shelves: 11.7-inchThe thickness of shelves: 1.18-inch Color Option: brown metal pipe / bronze metal pipeSize Option: 1-tier / 2-tier / 3-tierPackage Content InformationPackage: 2shelf + 2pipe + detailed instructions + all hardware accessoriesCare instructions: Wipe clean using a damp cloth and a mild cleaner. Wipe dry with a clean cloth. Avoid using harsh chemicals.we support 30-day free return and 12-month warranty. 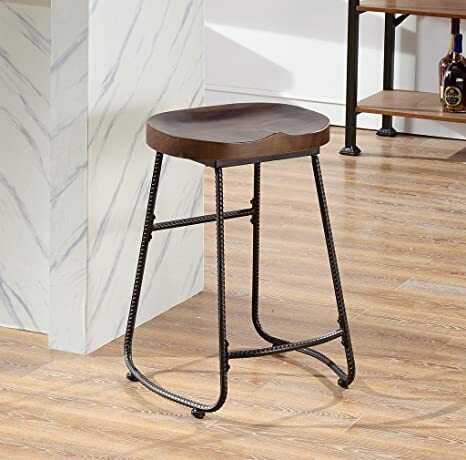 O&K Furniture Rustic, industrial-style bar stools available in 24-inch and 30-inch heights Seat Top Size: 16.512.6 inchSeat Height:24.6 inchWood Thickness: 1.85 inchMaterial: Solid Wood Top with Pipe Iron FrameProduct Description: This barstool are formed with Wooden seat with walnut finish and black twisted metal base. It can offer durable construction and industrial style. The vintage industrial style is simple but stylish. Put this bar chairs in a kitchen or home office to bring an urban industrial aesthetic to living space.It’s with comfortable, study footres, match all style furniture. Easy to Install, assembly instruction is enclosed inside of box. This industrial bar stools perfect to use in bar, pub, home, balcony, garden etc. 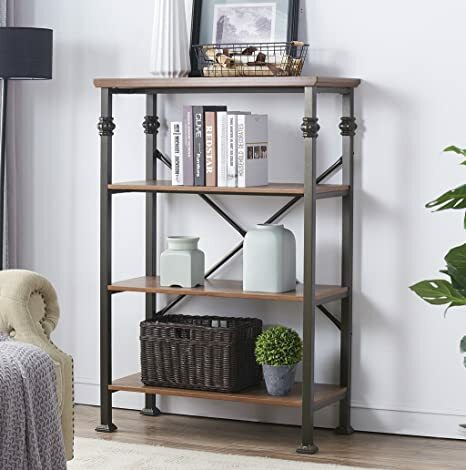 Designed to Enhance the Interior Decor This 6-Shelf openwork-styled etagere bookcase is the perfect stage for impressive collection, earthy ceramic vases, framed family photos or whatever you choose. A multitude of shelves reducesclutter and adds extra storage space. Six spacious shelves will accommodate home office supplies for every day necessities, helping to keep your room neat and tidy. 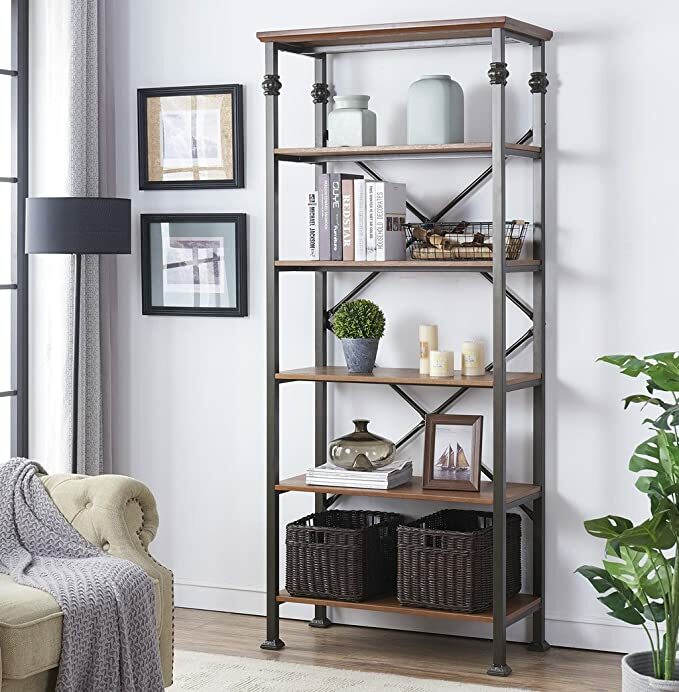 A functional and stylish addition to a home office or living space.A Multitude of Shelves Reduces Clutter and Adds Extra Storage SpaceNot only are they great for storing movie, magazine and novel collections, but they can also beautifully display decorations, photos and souvenirs. Alternately, they can also be used in the kitchen, bathroom or kids area to place daily utilities.Heavy-Duty Use Sturdy construction and durable materials ensure the shelves on this bookcase can hold a considerable amount of weight. Each shelf can accommodate up to 45-lbs. Extra Double Back Bars for a Better Stability and Resistance This tall bookcase has double metal back that contributes in organizing the books and prevents them from falling off at the back. Also, optional reinforce bar under the shelf provided for sustainable use. The bookcase can be wiped clean with a soft dry cloth to get rid of the dust and grimeSatisfaction Guarantee: We promise 30 Days Money-Back Guarantee and friendly customer service. 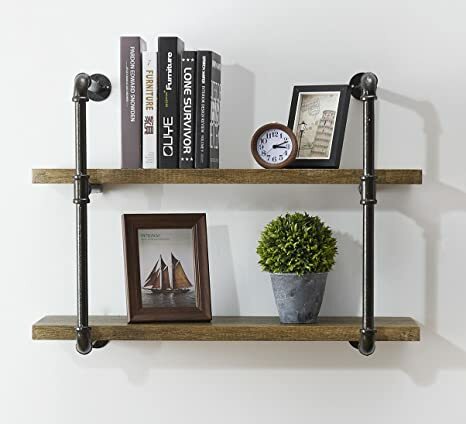 O&K Furniture 3-Tier Fashionable retro-style pipe wall shelf with quality brown metal pipe and vintage shelvesVersatile displaying: This plumbing piping shelf features sturdy long panel that stores plenty of decorations or pantry items to organize room space in tidy condition. To store and display picture frames, pot plants, collectibles, photos and other house-ware. Its industrial looking matches any decor. 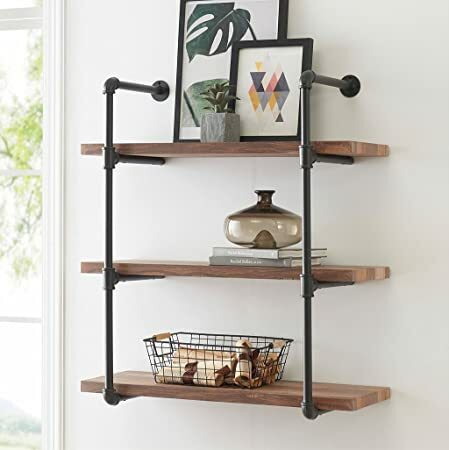 This pipe shelving are decorative and functional alike for your condo, office place or rustic cottage style home. Loft-style interior: It is great for someone who is looking for beautiful modern decor. 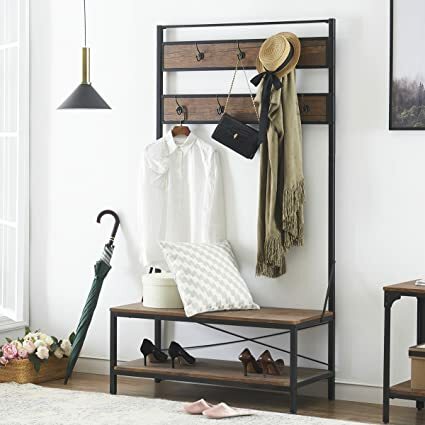 Set off your own personal leisure space with this industrial shelf. Cottage chic as it is urban, You can create a library of books, travel framed photo or use as a kitchen or bathroom rack in your loft to save space. The possibilitiesand use of this3-layer pipe shelving are endless.Assembly required:This wall mounted shelf is straightforward for your installation. Enclosed with simple instructions, It only takes you several minutes to assemble effortlessly. You can also gift this wall shelf to your near and dear ones.Pipe shelving dimension: 31″W12″D35″H.Height between shelves: 11.7-inch.The thickness of shelves: 1.18-inch. 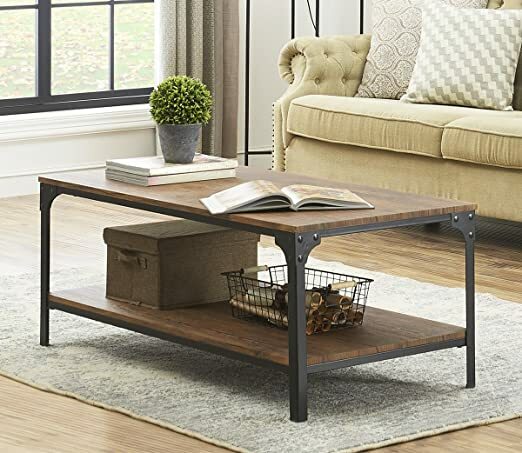 O&K Furniture Rustic Industrial Coffee Table with Open Shelf, Vintage Brown The 1.97-inch thick tabletop and four sturdy metal legs guarantee stability and sturdiness for the coffee table. 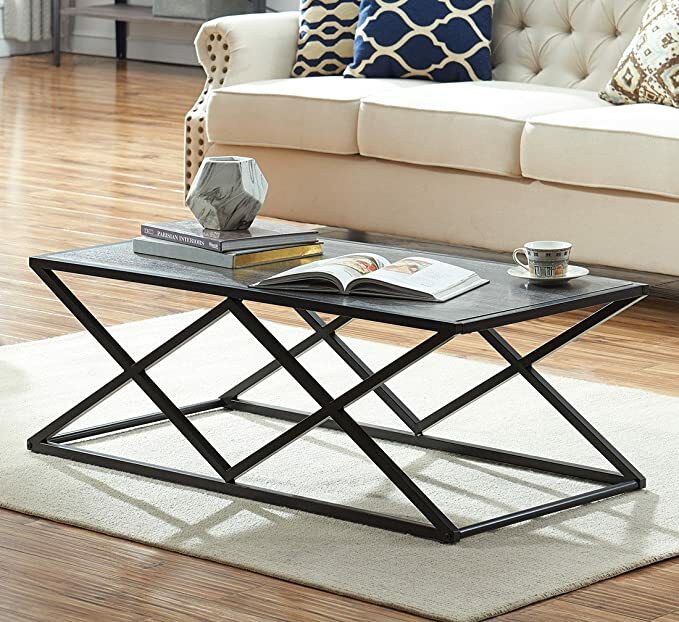 The minimalist design increases unlimited possibilities and compatibility make this versatile coffee table fits for almost living room, bedroom, den, rumpus room and any living space. Industrial and Rustic Style Black coated slender tapered legs with rivets decoration create a unique industrial looking. 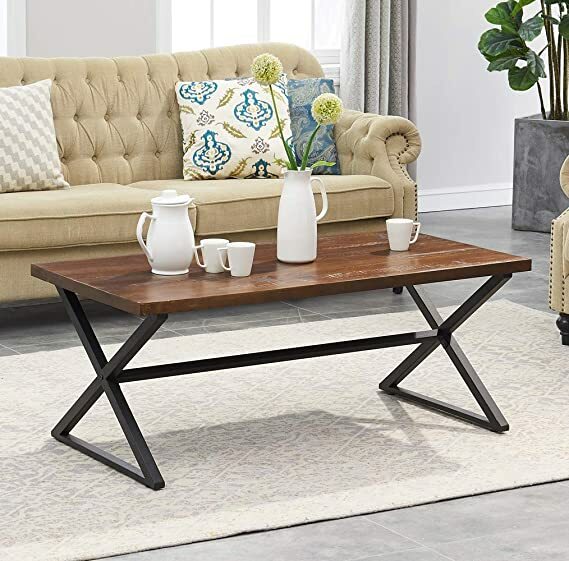 This lovely Coffee table with vintage brown finish blends effortlessly into any decor style and will add a rustic touch to your home. Matching end table are also available to blend in with home decor and surrounding furniture. Spacious and Multifunctional Double layer open design provided plenty of space for daily use. The lower shelf can be used as additional organizer for books and storage basket, while the tabletop is ideal for setting out after work drinks or Sunday snacks nearly. Whether in living room, office, den or cafe, the coffee table will work efficiently to keep your space clean and tidy, away from clutter. 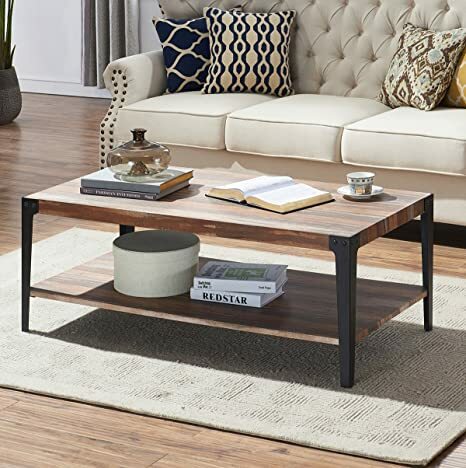 Specifications: Coffee table dimension: 47.8 (W) x23.8 (D) x 18.1 (H)- Inches Height between shelves: 9.64-inches Ground Clearance of Bottom Shelf: 5.8-Inches Thickness of Table-Top: 1.97 Thickness of lower Shelf: 0.71 Material: Thick Panel and Sturdy Metal Legs Weight CapacityHolds up to 210 lbs Net Weight: 45.7 lbs Gross Weight: 52.5 lbs Package Include: Coffee table x 1 pc + Instruction + hardware TIPS Two adults are recommended for proper and faster assembly. What Style Bookcase You are Looking for? 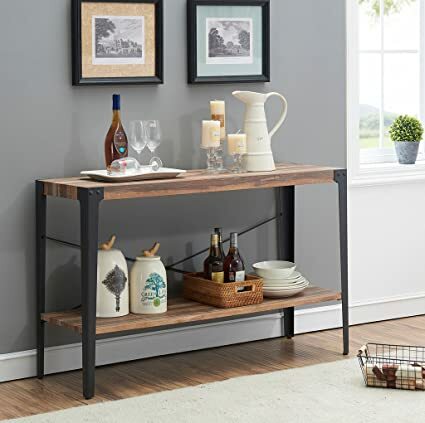 O&K Furniture 3-Shelf Black-Espresso Bookcase with Vintage Industrial rustic design, it easily fit with Most Dcor so You Can Enjoy It for Years to Come. 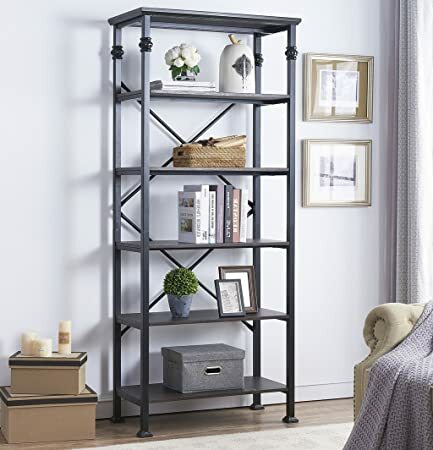 This openwork-styled etagere bookcase is the perfect storage for all of the books, picture frames and knick knacks you want showcased or need out of the way. 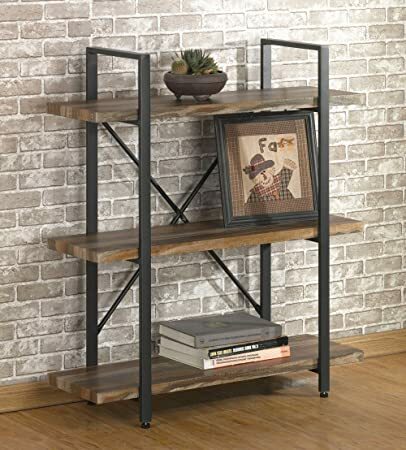 This shelving unit is durably constructed of metal and wood with a trendy industrial design. Features 4 pieces Metal Flower decoration, a stylish addition to any home office, hallway, living room or bedroom. Durably constructed of metal and wood with a trendy urban design, this piece is sure to be a favourite in your living space.Specifications: &#8853Material: Wood Veneer and Metal Tube Frame&#8853Dimension: 32.7 (W) x 16 (D) x 34.6 (H)- Inches&#8853Height between shelves: 13-Inches&#8853Color Option: Maple /Black-Espresso&#8853Size Option: 3-shelf / 4-shelf / 5-shelf / 6-shelf&#8853Weight Capacity: Holds up to 45 pounds per shelf and Maximum weight capacity of the whole Bookcase: 135 pounds (evenly distributed) Package:1 3-Tier bookcase + All necessary hardware+ instructionwiped clean with a soft dry cloth to get rid of the dust and grimeSATISFACTION GUARANTEE: We support 30-day free return and friendly customer service. O&K Furniture 4-Tier Industrial Bookcase keep your home neat, tidy and organized, and to offer ultimate convenience in household organization.This storage shelf is constructed with maple finished wood veneer and a metal support frame, giving this shelf its industrial look.The metal cross back provides extra support and style, open design provides the right amount of storage space.Multiple Usage: The top shelf of the bookcase is suitable for displaying picture frames, decorations or daily necessities.For the lower three shelves, you can freely distribute.Not only do you showcase a variety of green plants and collections, you can store your favorite books, storage box and more.Extra Large Space: Open design extends more space, compared with closed bookshelves, can store more items.Even in small spaces, apartments or dormitories, there is no room for crowding, and the occupied area of this shelf is small.Product DetailsBookcase Dimension: 32.7 (W) x 16 (D) x 34.6 (H)- InchesMaterial: Wood Veneer and Metal Tube FrameWeight CapacityHolds up to 45 lbs per shelf is recommendedGround Clearance of Bottom Shelf: 5.91-InchesHeight between Shelves: 13-InchesThickness of Top Shelf: 30 mmThickness of Tier Shelf: 15mmWe support 30-day free return and 12-month warranty.